My dad told me I needed some "real food" on my blog. Silly father, cheese puffs, brownies & cake are real food. I mean, they may not be the healthiest thing ever, but they are real food! Especially if you compare them to half of the things in the supermarket today - no artificial color, xanthan gum or Microcrystalline cellulose here! So dad, here is some real food: Buffalo wings, adapted to be healthy. They have protein, W sauce, hot sauce, love & deliciousness. So I better not be getting a phone call later saying that I yet again didn't post real food. As you probably guessed it, I made these for the Superbowl. You'd also be correct if you guessed that I took this picture after I let all the vultures swoop in and take part in the wing feast. I made somewhere in the ball park of 25 wings and 10 minutes later, these are all that were left. For the actual cooking part, please make sure you have some jellyroll pans. Aaron and his roommate somehow didn't own a single one and I had to jiffy-rig an aluminum foil covered oven rack in its place. It worked, but not so well. The chicken drippings dribbled all over the bottom of the oven, set off the fire alarm a few times (it's not good until the fire alarm goes off, am I right?) and had to crack every window in his apartment. Even with all that drama, these turned out so well. Aaron and his roommate made sure I talked them through the recipe and gave them a copy so they could make the wings again & again. Best part, this was my first time ever making wings. In the words of Charlie Sheen, WINNING! Rinse the wings and pat them dry, then toss in a bowl with the oil and a good pinch each of salt and pepper. To make the sauce: Melt the butter over low heat in a sauce pan. Remove the pan from the heat then whisk in the remaining sauce ingredients. Taste for spiciness, and add cayenne if desired. Toss the wings with a quarter of the sauce and refrigerate for an hour. Preheat the oven to 400 degrees. Grease a foil-lined baking sheet with a neutral oil such as canola, using a paper towel or brush to ensure it coats all of the surface. Arrange the wing pieces skin-side-up. Bake for 30 minutes until golden brown, and until the wings release easily from the baking sheet. Using a pair of tongs, turn the pieces over and return to the oven to bake for an additional 10 to 15 minutes, until crisp. 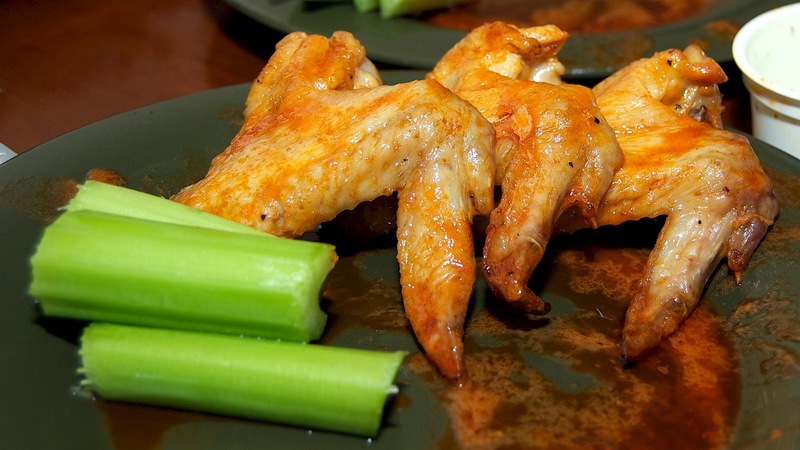 When the wing are finished cooking, pour the Buffalo sauce into a shallow bowl and add a few wings at a time. Turn them in the sauce until well-coated, then transfer to a platter. Repeat with the remaining wings. I gotta make these for french bf and his entourage. We can have an american appetizer night...mmm :) Any suggestions for sauce if we don't have franks here in Marseille ?